Rifting at Hi'iaka Patera, Io? A montage of images of the small inner moons of Jupiter from the camera onboard NASA's Galileo spacecraft shows the best views obtained of these moons during Galileo's 11th orbit around the giant planet in November 1997. At that point, Galileo was completing its first two years in Jupiter orbit--known as the Galileo "prime mission"--and was about to embark on a successful two-year extension, called the Galileo Europa Mission. The top two images show the moon Thebe. 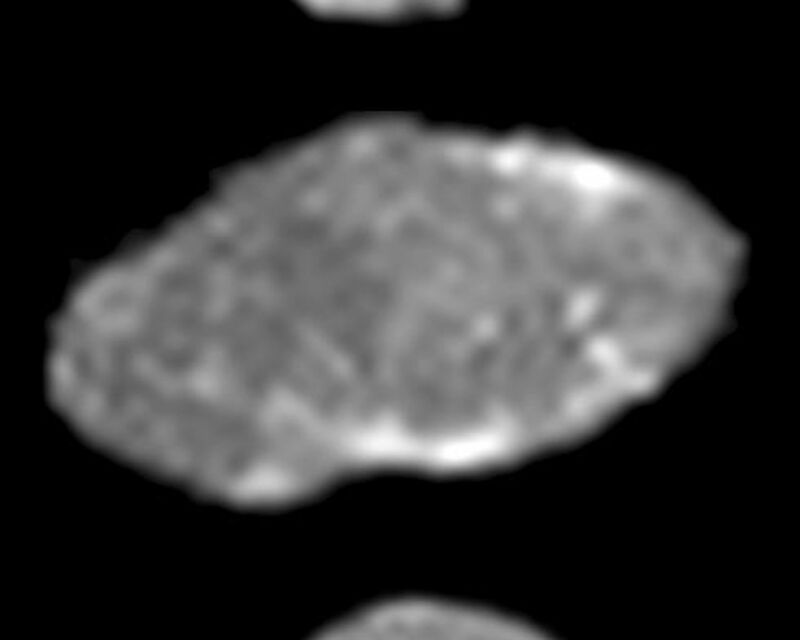 Thebe rotates by approximately 50 degrees between the time these two images were taken, so that the same prominent impact crater is seen in both views; this crater, which has been given the provisional name Zethus, is near the point on Thebe that faces permanently away from Jupiter. The next two images show the moon Amalthea; they were taken with the Sun directly behind the observer, an alignment that emphasizes patterns of intrinsically bright or dark surface material. The third image from the top is a view of Amalthea's leading side, the side of the moon that "leads" as Amalthea moves in its orbit around Jupiter. This image looks "noisy" because it was obtained serendipitously during an observation of the Jovian satellite Io (Amalthea and Io shared the same camera frame but the image was exposed for bright Io rather than for the much darker Amalthea). 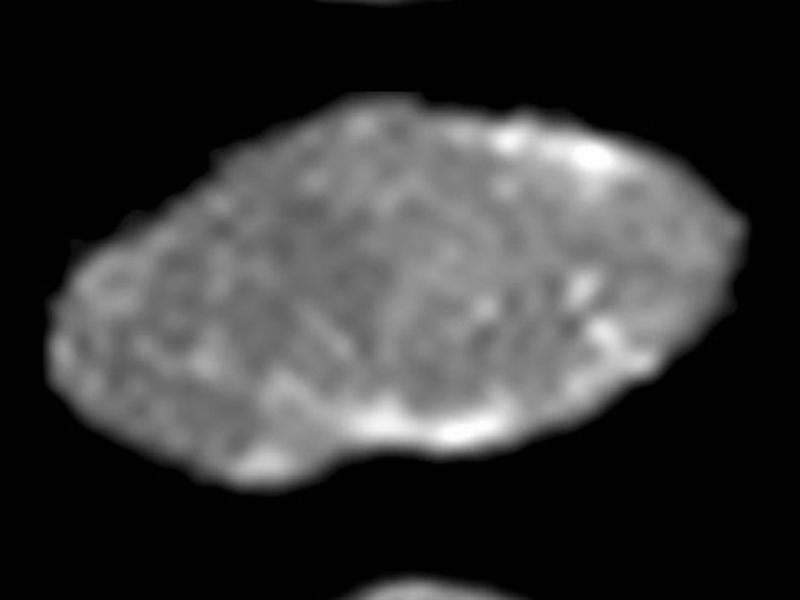 The fourth image from the top emphasizes prominent "spots" of relatively bright material that are located near the point on Amalthea that faces permanently away from Jupiter. 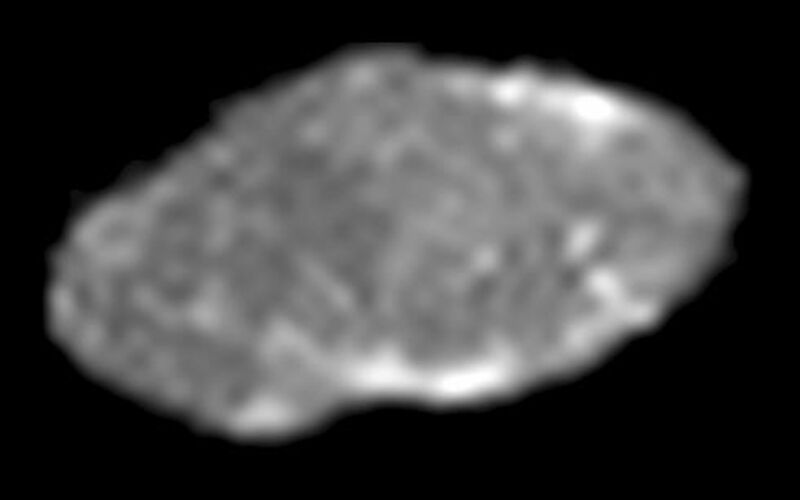 The bottom image is a view of the tiny moon Metis. In all the images, north is approximately up, and the moons are shown in their correct relative sizes. The images are, from top to bottom: Thebe taken on November 7, 1997 at a range of 504,000 kilometers (about 313,000 miles); Thebe on November 7, 1997 at a range of 548,000 kilometers (about 340,000 miles); Amalthea on November 6, 1997 at a range of about 650,000 kilometers (about 404,000 miles); Amalthea on November 7, 1997 at a range of 475,000 kilometers (about 295,000 miles); Metis on November 7, 1997 at a range of 637,000 kilometers (about 396,000 miles).